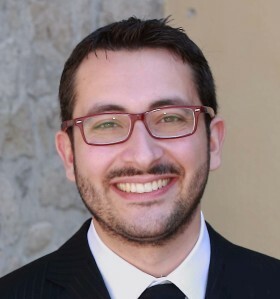 On this website, you will find my resume, a searchable list of my publications and information on my research (under construction). If anything triggers your attention, feel free to contact me. 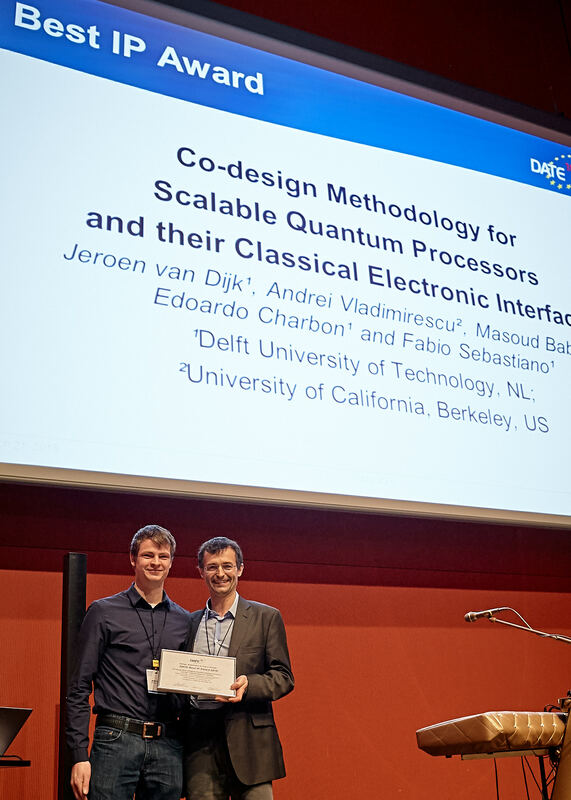 Jeroen van Dijk (left) receiving the Best IP award at DATE 2018 (copyright: DATE 2018). Last week we were awarded the Best IP award at the DATE 2018 (Design Automation and Test in Europe) conference in Dresden! In this work, we presented, for the first time, a comprehensive methodology to co-design a quantum processor and its electronic interface. 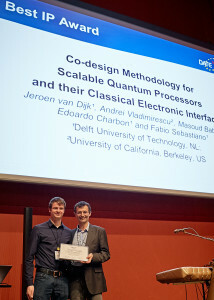 As a result, this methodology will enable the design of the electronic interface for scalable quantum computers, i.e. quantum computers with enough power to address relevant practical problems. A quantum computer fundamentally comprises a quantum processor and the classical controller required to manipulate the quantum bits (qubits). To enable the design of future quantum computers comprising millions of qubits, both the classical electronic and quantum processor must be simultaneously optimized. In the proposed co‐design methodology, qubit performance can be optimized while considering practical trade‐offs in the control circuits, such as power consumption, complexity, and cost. To this end, we have developed SPINE (SPIN Emulator), a toolset enabling the co-simulation of qubits (single‐electron spin qubits in the current implementation) and standard electronics. SPINE can run in Matlab or as a stand-alone C++ application, but also, more interestingly, its VerilogA implementation can be integrated into Cadence, the standard platform for integrated circuit design. As a result, the proposed toolset will be the basis for future electronic designers aiming to build the electronic interface for future scalable quantum computers. A practical application of this toolset can be found in our new work posted on arXiv: The impact of classical control electronics on qubit fidelity. Great news! NWO awarded an Open Technology Program grant to a team of PI comprising Carmina Almudever, Giordano Scapucci, Menno Veldhorst, and myself, all from TU Delft. Quantum computers hold the promise to solve problems that are intractable even by the most powerful supercomputers. With a budget of 1.2 M€ and over the span of 5 years, we will investigate how to build a practical quantum computer, and move from the current lab prototypes towards quantum computers with the capability to solve real-life problems. Building on the expertise of a multi-disciplinary team, we will address the challenges of building a large-scale quantum computer by attacking the problems at several levels, ranging from material engineering and quantum operations up to cryogenic control electronics and computer architecture. Fats progress will be facilitated by collaborating with industrial partners: Intel, the world-leading computing company, that will contribute to the fabrication of large qubit arrays, and Bluefors, leader in cryogenic refrigeration, that will participate in the development and deployment of cryogenic electronics to interface with the qubits. Stay tuned to hear about the progress! And drop a message if you are interested to participate in this research journey as a Ph.D. student! The project Principal Investigators (from left to right): Menno Veldhorst, Giordano Scappucci, Fabio Sebastiano, and Carmina Almudever. The Distinguished Lecturer program of the IEEE Solid-State Circuit Society (SSCS) provides world-renowned experts in the field of integrated circuits (IC) to give lectures and seminars at regional and local venues around the world. The aim is to educate and spread knowledge on a wide range of topics focusing on state-of-the-art IC technology. To arrange a visit in the context of the SSCS DL program, you can contact me directly or visit the SSCL DL website. Cool down your microchips to build a quantum computer… and do more! Designing a quantum computer is not an easy task. Recently, we developed a methodology (and the relative tools) to co-design electronic circuits and quantum bits (qubits). It will be presented at the DATE 2018 conference (Design, Automation and Test in Europe) in March in Dresden (Germany). 2 papers at ISSCC 2018! The following 2 papers have been accepted for presenation at the 2018 International Solid-State Circuits Conference (ISSCC) (a.k.a. the chip Olympics)! Intel fabricated and packaged a 17-qubit superconducting quantum processor! M. Incandela, L. Song, H. Homulle, F. Sebastiano, E. Charbon, and A. Vladimirescu, “Nanometer CMOS Characterization and Compact Modeling at Deep-Cryogenic Temperatures,” ESSDERC 2017 – European Solid-State Device Research Conference, Leuven, Belgium, 11 – 14 Sep. 2017. Pedalà, Ç. Gürleyük, S. Pan, F. Sebastiano, and K.A.A. Makinwa, “A Frequency-Locked Loop Based on an Oxide Electrothermal Filter in Standard CMOS,” ESSCIRC 2017 – European Solid-State Circuit Conference, Leuven, Belgium, 11 – 14 Sep. 2017. I will give an invited talk at SiQIP 2017 with title “Cryo-CMOS Electronics for Scalable Quantum Computing” in Lancaster in September. Coming August, my group will have several contributions at the Silicon Quantum Electronics Workshop in Hillsboro (OR). This is the reference workshop for the community working on silicon qubits, i.e. basically spin qubits.